Jason and I love to make our own pizza. We alternate between making our own and buying pizza depending on our schedules and what we have time for that night. Tonight we were able to make our own. They were delicious!! We've been making them for awhile since we found a fantastic whole wheat pizza crust recipe. We will make the full amount and freeze half the dough for another time. 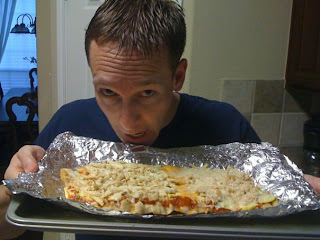 We also have used pita bread (like we did tonight) and the pre-made pizza crust. Our homemade one definitely tastes the best though! We also love that we can use ingredients from our garden - like basil. It definitely makes the pizza better. We can't wait for the summer when we can plant tomatoes again and use the delicious homegrown ingredients on our pizza! On nights we don't make our own we will try pizza from somewhere near us or go out for pizza or pick one up on the way home. The best pizza we've tried so far is Brothers Pizzeria near my office. 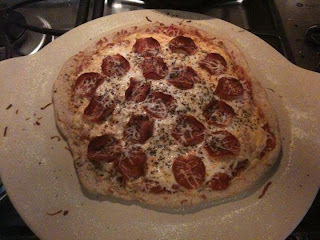 Here are some of our previous pizza creations! We tried grilling our pizza one time. It was a little technical, but tasted amazing and was worth the care it took to cook it.